My father was Joseph Pisano. He wasn’t a hero to anyone but me and those who loved him, nor did he fight in combat, though it wasn’t for trying. He joined the Navy at the age of 17 against the wishes of his parents in 1944, lying about his age to get into the Second World War. He went through boot camp at the old Naval Training Center at Bainbridge, Maryland, and later was trained to become an aviation mechanic for a squadron of Avengers. After a brief assignment on the USS Philippine Sea (CV-47), he was discharged in the post-war drawdown. A few years as a civilian were interrupted when the Korean War broke out. Though still in the Navy Reserve he found himself drafted into the U.S. Army where, he did his basic training at Ft. Dix in New Jersey, and then combat training at Ft. Benning in Georgia. Though he volunteered for combat in Korea, the Army stationed him in Germany and assigned him to the artillery. He rose to Sergeant First Class before being discharged in 1952. He was admired for his diligence, hard work, and leadership—qualities that he carried with him throughout his life, along with a fiery temperament. An otherwise unassuming man, he never made more than $20,000 in any one year, but he owned what he had, and lived life on his own terms, even when it meant that he swam against the tide of the times. He was a co-founder of the Toms River, New Jersey Little League, and mentored many a young man and woman over the years. To this day I meet men and women who tell me that my father had a profound and positive influence in their lives. He was loyal to his family, his wife until the day of her passing, the New York Yankees—and to me his only child. 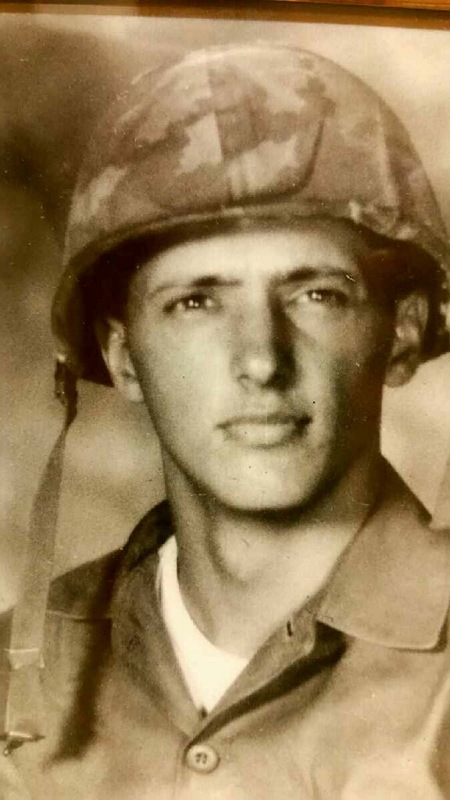 The times my father served in the Service were among the most significant of his life. He impressed upon me the values of hard work and dedicating oneself to something greater than one’s self-interest. His was among the first generation American immigrant experience. As with many people previously disenfranchised and looked down upon by previous arrivals, Italian-Americans felt a need to demonstrate their commitment to a country that promised, though did not always live up to, a measure of human dignity and equality. Here, in the United States, was at least the chance of not bowing to the rich man on the hill, to be told what to think and do, and to owe one’s existence to the whims of the rich’s largesse. Here a man or woman could stand upright and look his or her fellows in the eye, to get one’s rights—or at least to have a fighting chance to get them. 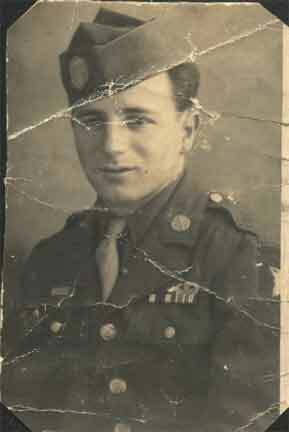 The photo above is of Nick Rubino, my mother’s brother and my namesake. Though I was named for my paternal grandfather Nick, my mother had a special place in her heart for her younger brother. She confided to me one time that she was proud that I shared the same name of the sensitive little boy whom she remembered would cry if someone stepped on an ant. She saw the same characteristics in me. My Uncle Nick, as I knew him, was a very gentle and quiet man. He was the father of twin girls, my cousins, who were named Tony and Mary. The sisters, children themselves just a few years older than me, watched over me when I was a very small boy. I have many early memories of them dressing up the four year old me and including me in their make-believe worlds. They were very kind to me, as was their father. Nick Rubino was late when he came of age to serve in the Second World War. He went to basic at Ft. Dix and was sent to jump school where he became part of the 101st Airborne Division. He arrived in France after D-Day and was among the fresh troops in Belgium being positioned in December 1944 prior to the push into Nazi Germany. My uncle never talked of his service. He didn’t tell sea stories or brag about what he had done. But something took hold of him one day. An old friend had passed away and my uncle began to drink in a way that he had not done in quite a long time, and his memories of the war began to spill out. He opened an old footlocker that he had kept under his bed and took out his medals and insignia, a German helmet with a bullet hole stained with old blood, a Luger sidearm, a bayonet, and other items, laying them on the floor. He began to tell us in a very quiet voice about what has become known as the Battle of the Bulge and the encirclement of the 101st Airborne in Bastogne, Belgium. He recalled each of his friends and how they had been killed or captured. The Americans had dug themselves in to repulse the German offensives, which for the foot soldier mostly involved combat at close quarters if one survived the artillery and mortar shelling. His outpost was at the top of a hill outside of the town. The command at Bastogne tried very hard to break out of its encirclement and so they sent my uncle and his comrades down that hill to find a weak spot in the German lines. Three times they attempted to break out and each time were repulsed, and then themselves repulsed German counterattacks. After each battle the number of Americans was diminished. My uncle described nights of pure fear, and days filled with the most horrible scenes of industrialized murder. When I look back at the things he described, sobbing and pounding the floor with his fists, I can only say that my uncle was momentarily transported back in time in his mind, and that in that moment he had lost his mind, as he must have done living in the horror of that forest in Belgium. A U.S. tank under the command of Patton’s 4th Armored Division arrived on that hill around the 9th of January 1945. Bastogne had been encircled for three weeks, under constant bombardment and deadly attacks. The tank commander called for the members of the 101st who had been positioned on the hill to come out of their foxholes. The only man left in his Company not killed, severely wounded, or captured was Nick Rubino. The tank commander who liberated that hill was my father’s brother, William Pisano. They did not meet again until February 1953 when they met at my parents’ wedding rehearsal. In 1945 my parents had not yet met. The Pisanos and Rubinos were not closely associated with one another, though the former lived in what used to be known as lower Weehawken and the latter from Hoboken in New Jersey separated merely by a mile. It was just one of those things. When night overtook us and the alcohol took its toll on him, my uncle quietly returned the items to the footlocker. He never spoke of the war again, nor did he speak to us about what he described that day that went late into the night. 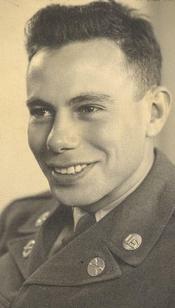 William Pisano, the man who I do not have a photo in uniform, was, like my Uncle Nick, a hero by any measure. He joined the war early and joined the tank corps. He participated in Operation Torch in North Africa under the 1st Armored Division where he was involved in many of the earliest direct battles with German forces. At the Battle at the Kasserine Pass his tank was destroyed by Panzer fire. His life was saved by the sole African-American tank crew member who, not fearing for his own life, threw my uncle from the tank just before the man was killed by machine gun fire. When he returned to the United States he remembered the man who had saved his life and supported the drive for equal rights for all Americans. The American defensive positions were overrun that day in North Africa, and my uncle was forced to fight his way back to the Allied lines. Suffering from burns, shrapnel, and multiple bullet wounds, he was sent to England to recuperate. By June 1944 he was found fit for duty and participated in the landing of armored units following the D-Day invasion. Assigned to the 4th Armored Division he continued to be deployed against German forces in battle until the end of the war. My father and my Uncle Pete, William’s other two brothers, complained that when he returned that my grandparents babied him. But I think that it was because they saw what no one else at the time saw. My Uncle “Chick,” as he was called, never fully recovered from the war. Today we recognize the signs of his behavior as PTSD, but at the time it was simply not fully understood. Eventually the night terrors passed, the screaming in the night, the sleepwalking that caused him to believe that he was surrounded again and had to fight those around him. From time to time he drank too much, lost his temper, and suffered from long bouts of depression. But, on the whole, he was a good and loving son to his parents, my grandparents, and a good brother, father, and husband. He worked hard throughout his life and provided for his family. He paid his dues. He always treated me with kindness and encouragement. The only descriptive for him that comes to mind is that he was a good man. That’s as good an epitaph as any. Ruben Soliman pictured above, who retired from the United States Navy is my best friend. He was best man at my wedding in Key West and, during challenging times, was a surrogate father to me. 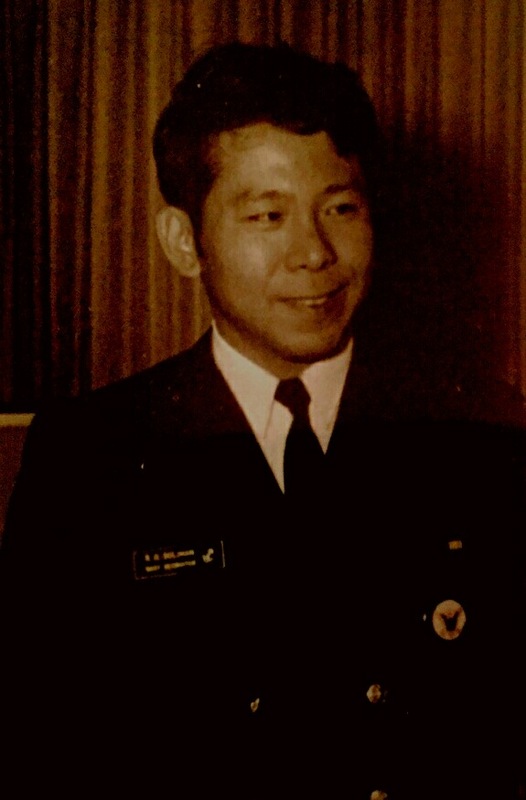 Ruben followed his distinguished Navy career, retiring as a Chief Petty Officer, as the Deputy Material Officer at Naval Air Station, Norfolk. There I had the pleasure of working with him. Ruben taught me many life lessons, and has provided much wisdom. When he was a small boy he survived the Japanese occupation of the Philippines. Many people forget that the Philippines was a possession of the United States for almost 50 years. As such, it was U.S. territory when it was invaded in 1941. The Filipino people were Americans–and many who inhabit those islands are still Americans in their hearts. Many of them emigrated to the United States by serving in the U.S. military. Ruben followed in that tradition, and is the epitome of what it means to be an American. He is soft-spoken, he does not brag, he is loyal and loving. He is a natural leader, and in some very challenging situations, he was always level-headed and steel-nerved. I am proud to call Ruben my friend. I admire him a great deal. I aspire to be as good a man as Ruben. Tommy Jones served in the United States Marine Corps. He is a big man with a very big heart. If I ever had a brother, I could only wish that it would be Tommy Jones. He served his country during a time when serving one’s country in the military was falling out of favor. As with most veterans, Tommy does not brag about his service, except to state emphatically that he is a Marine, still. I admire Tommy. He demonstrates kindness, courage, and modesty. Tommy is Ruben’s brother-in-law and, watching him, I can truly say that to me Tommy epitomizes loyalty and reliability. When the chips are down, Tommy is the guy who you want to be there. You can rely on him–put your life in his hands. I would trust him with mine. 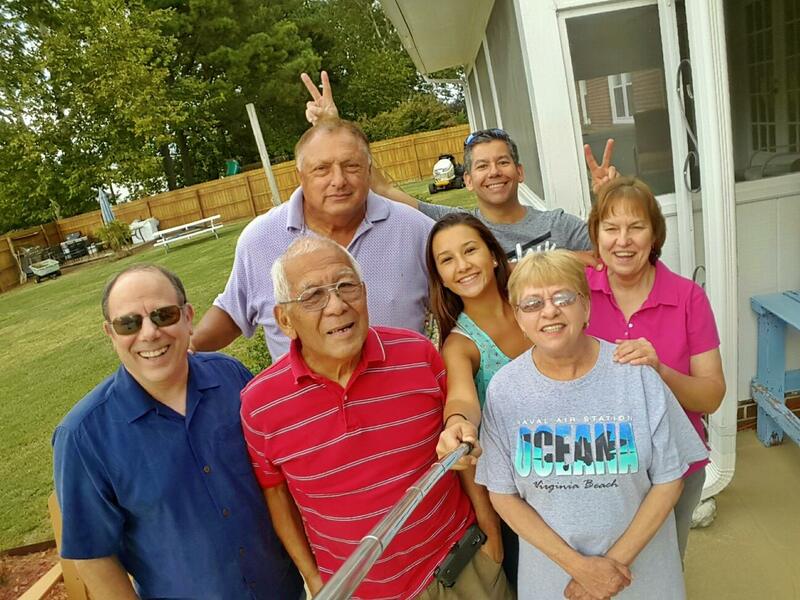 Tommy Jones (purple), Ruben Soliman (red), their families, and me (in blue), 2015. Finally, there is John Paul Pisano, my son. I have a number of photos of him in uniform that have not yet been scanned for this blog. I will need to rectify that deficiency in the near future. When my son told me that he was joining the Marine Corps, I must admit that it was with both pride and trepidation. Pride because I knew that he had to just one-up his U.S. Navy career dad by joining the toughest of all of the Services, bar none. I have always been able to rely on the Marines with whom I served, that they were true to their country, the Constitution, and to their Creeds. When Bill Clinton became President of the United States I attended a Dining In shortly after his first inauguration where the senior officers at the head table, confusing their personal ideology with their service and Oath, refused to rise when the toast to the President of the United States was announced. I raised my glass and looked around. Only myself, one other Navy Officer, and every other member of the United States Marine Corps who were present rose, and held their glasses high during the playing of “Hail to the Chief.” The Marine Lt. Colonel in the audience looked around and called “Attention on Deck!” A number of other Navy officers then rose and toasted, defying the senior officers who dishonored themselves and their commissions that day. When I was a Supply Officer on a tank landing ship and Boat Group Commander, I had the pleasure of serving with the Marines in both fair and foul operations. I formed a bond with my fellow officers when engaging in counterterrorism operations in Southeast Asia in the early 1980s. The Marines with whom I operated made it plain that they would fight anyone who threatened our position, and the safety of the ship–and they had a brief opportunity to prove it. Thus, when my son decided to join the Marine Corps, I knew that he was joining a Service with a long and proud tradition. Though there is a great deal of inter-service rivalry, the fact of the matter is that the Navy cannot perform its mission without the Marines. Nor can the Marines perform theirs without the Navy. Both have fought and bled together from the beginning of the United States. This makes the soldier, sailor, or marine unimportant as human beings. They have become like the burger flipper in the minds of the political establishment and economic elites, though the difference, of course, couldn’t be greater. They are seen as there to do a dirty job and then be forgotten, reminded to stay in their place. After all, they are reminded, you volunteered. Personnel medical and pension expenses are viewed as if it is corporate America–even within the confines of the E-ring at the Pentagon, and among the senior staff. Like the protagonist in the book Billy Lynn’s Long Halftime Walk by author Ben Fountain, there is nothing for us to do than to support each other, and hold on to one’s ideals. My son was in Okinawa when the Twin Towers fell. It wasn’t long before he was sent to combat in Afghanistan during the initial invasion there. The occasional details he provides of his service while there are that it was a miserable place and the days were mostly boring, punctuated by the proverbial moments of terror. When he returned home for duty in North Carolina, it was with a great deal of relief and thankfulness. I was living in western Virginia at the time, and thought I would finally be able to see him from time-to-time. But there was another invasion to come, this time in Iraq. During the run to Baghdad he was at the pointy end of the spear. He wrote occasionally of his experiences, which involved combat and riding in convoy. He then served in country for the initial occupation, and was returned home with severe physical issues. For the longest time he wouldn’t talk to anyone, seemed to hold a burning resentment. The gentle and sensitive boy I had raised had been changed. I felt a great deal of guilt at this condition. After all, I had served a charmed life in the service. I joined at the end of the Vietnam War and retired four years prior to 9-11. The Cold War was anything but safe, especially in the many years I served in operations at sea and overseas, but there is no comparison in my experience to those of the men and women who have served since 2001. My anchors in placing all of this in perspective were the men and women who had served in Vietnam, just as they and the Second World War and Korean War vets had been my mentors and anchors when I was first a young enlisted man, and then later when I achieved my commission. But time and patience have brought my son back to me. As I sit here and write this post on Veteran’s Day 2015 I am thankful for having him once again, that he went through a trial by fire, and came out stronger and wiser for it. John Pisano is the bravest man I know. I couldn’t be prouder to be his father. But it is not just because of his service. It is because of what he took from that service–for the caring and thoughtful man he has become. Just as the unassuming and dedicated men named above were and are caring and thoughtful. Just like William Pisano, who through his awful experience, learned to see the humanity of everyone despite the separation of skin color that was common in his time. Just like Nick Rubino who lived a quiet life taking care of his wife, his children and his mother, and who never revealed the many decorations for bravery he earned on that hill outside of Bastogne to his family, who only learned of them at his funeral by a contingent sent by the local VFW. Just like Ruben Soliman and Tommy Jones who are good family men–and good friends–and have continued to serve their communities is so many ways. And just like Joseph Pisano, who took so many young people under his wing regardless of their color, creed, and ethnicity, to help them realize their intrinsic worth. Hear, hear. I had breakfast at Denny’s this morning, with a man who served in the Air Force in Viet Nam and later an enlistment with the Marines in Okinawa. Bob is in his late 60’s, walks with a cane, and mostly lives in a physical rehab center. I had lunch at a pizza place with Richard, a 30 year-old former MP. The Army refused to let him re-enlist because he didn’t sufficiently recover from an IED blast in IRAQ. I explained that they refused to commission me, because I had too many years in service. Just three guys getting a free meal on Veteran’s Day. I told my wife about it, and she said, “You had a good day.” Yes, I did. Best day in quite a while. Thanks to you and the other men of your family, for being the kind of men I like to share a meal with. Peace be with us.